Scan this QR code with your Smart Phone to save This Listing! Click the Image Directly ^^^Above^^^ for More Information, Current Pricing and Availability. You will not be charged until after you review and complete your order. 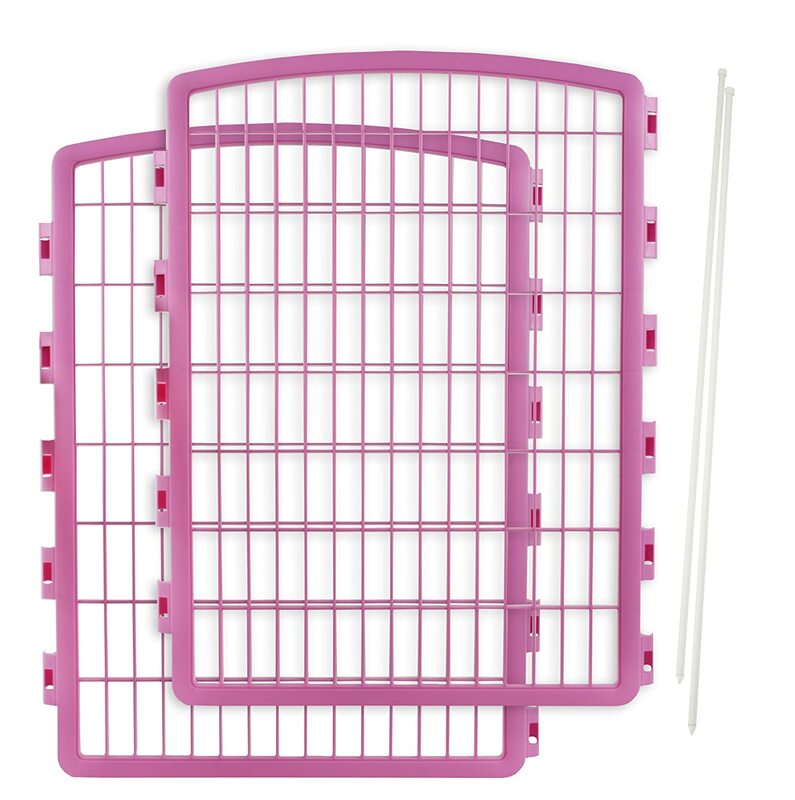 Designed specifically for IRIS 8-panel indoor/outdoor pet pen in pink, this 2-panel expansion kit will create a 10-panel pen measuring 80-inch by 80-inch by 34-inch h. The pen can be arranged in multiple different shapes to fit your pet needs and available space. Assembles or disassembles in seconds. Made of durable, heavy-duty molded plastic and will not rust. "The Big Tug" - Dog Fire Hose Tough Bite Tug for Medium - Extra Large Breeds!!! : Bubba's Rowdy Friends Pet Stain & Urine Eliminator has been Veterinarian recommended. Bergan EZ Steps Big Dog Leash Coupler 36"
Bergan EZ Steps Low Impact Leash Coupler 43"
Black Silicone Sport Medical Alert ID Bracelet. Incl. 6 lines of personalized engraving. Dean & Tyler Leather Dog Collar "SILVER FIRE"
Dean & Tyler Seizure Alert Dog Patches - Fits Medium Harnesses - 5" Length By 1.5"
Dean and Tyler "Patch Collar"
Dean and Tyler Simply Stitched Pull Tab Leash, Black 8-Inch by 1/2-Inch Width With Herm Sprenger Hardware. Dean and Tyler Tamed Handle Leash, Black 1-Foot by 1/2-Inch Diameter With Short Handle And Solid Brass Snap Hook. Dermoscent Bio Balm Skin Repairing Care for Dogs - 50 ml. Dog Light, Bubba's Leash Light, Dog Collar Light - 2 Per Pack - LED Light for Dog Walks & Backyard Monitoring. Dog Supplies Metal Gate 30" Tall 29-52 Wide"
Douxo Chlorhexidine PS Shampoo 16.9 oz. Dynotag® Web/GPS Enabled QR Code Smart Round Metal Tag and Ring. Emerg Alert Medical Alert Emergency ID Bracelet and Wallet Card - "Coumadin"
EZwhelp Washable Whelping & Puppy Pad 41" x 41"
EZwhelp Washable Whelping & Puppy Pad 72" x 72"
Gold Vet Naturally Calm with L-Theanine. Relieve Aggressive Behavior Caused by Stress or Fear. HERM SPRENGER ORIGINAL BUNDLE PINCH COLLAR WITH NYLON COVER!!! High Quality Genuine Leather Braided Studded Dog Collar, Brown 1.25" Wide. Fits 16"-20.5" Neck. High Quality Genuine Leather Braided Studded Dog Collar,Red on Black 1.25" Wide. Fits 16"-20.5" Neck. I Drop Vet Plus Eye Lubricant - Multidose Bottle - 10 Ml. Men's Stainless Steel Black Rubber Medical ID Bracelet 8.5"
NEW Extra Large 54" x 34" Beasley's Couch Dog Bed! Osteo-Pet Total Joint Care for Dogs - Glucosamine Chondroitin, MSM, Hyaluronic Acid, Boswellia and more. Pet-Tabs CF ( Calcium ), 180 ct.
Pet-Tabs Plus CF (Calcium Formula), 180 ct.
Pro-Treat Beef Liver, Freeze Dried Dog Treats - 475 pieces in each tub. PTSD Post-Traumatic Stress Disorder Medical ID Alert Italian Charm Bracelet P.T.S.D. Rectangular Pillow Dog Bed - Size: Large - 36x48"
Sulfodene First Aid Skin Medication for Dogs, 4oz. SynergyLabs Veterinary Formula Clinical Care Antiparasitic & Antiseborrheic Medicated Shampoo for Dogs; 16 fl. oz. Zampa Pet Exercise Playpen, Kennel. For Dogs and Puppies. 2 Access Doors + Removable Top. Zymox Ear Cleanser With Bio-Active Enzymes, 4 oz. Zymox Plus Otic-HC Enzymatic Solution, 1.25 oz. Please enter your message and data to this form or simply click the submit button below.